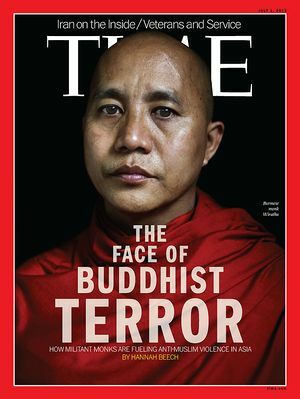 The campaign against the Rohingya and Muslims in Myanmar is spearheaded by controversial monk Ashin Wirathu. Once referred to as the “Burmese bin Laden,” he is the leader of an ultranationalist group called 969, which opposes the growth of Islam in Myanmar. He was jailed in 2003 for inciting hatred and stirring sectarian clashes and released in 2010. The documentary on Wiranthu, a buddhist monk accused of preaching hatred against the Rohinya minority stirred audiences at the film festival. Another country where fierce Buddhism has recently made headlines is Myanmar, formerly known as Burma. A Buddhist faction there, the 969 movement, is known for strident anti-Muslim campaigns that have triggered widespread violence. Its leader, Shin Wirathu, was recently invited to Sri Lanka by the BBS. Both organisations say that even if Buddhism predominates in their own countries, overall it is under threat. "We want to protect it, therefore we signed a memorandum of understanding on forming alliances in the Asian region," says Withanage. This page was last edited on 24 December 2017, at 08:19.